Before beginning to play, take the original 13 dice that came with the game and set aside the 6 green dice. These will not be used in this variant. This will leave you with 4 yellow dice and 3 red dice for a total of 7. These will be used in this variant. Set aside the 26 colored counters. These will be used to keep track of scoring throughout the game. The game will consist of two sides, Zombies and Hunters. You will play either side of your choosing, although the Hunters do have a slight advantage based on the number of shotguns on the red dice. The goal is to score 13 points either for the Zombies or Hunters, based on which side you choose. Replay value is considered high for this variant. This variant is designed to play in less than ten minutes time per game. Choose a side, either Zombies or Hunters and a counter color for your side that you choose. 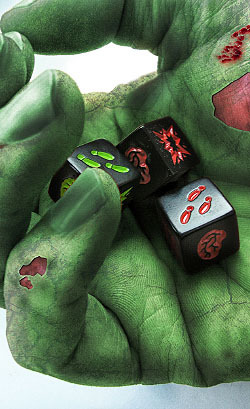 Take the shaker-cup that comes with the Zombie Dice game and put the 4 yellow dice and 3 red dice in the cup. Shake the dice up really well. Remove 3 dice (randomly) from the cup without looking at the colors of the dice. Roll the three dice and put aside the brains for the zombies and the shotgun blasts for the hunters. Each set of footprints will be rerolled. Reroll any footprints that were rolled from step 5 and follow the instructions from step 5. Take out another three dice (again randomly) and follow step 5. Take the last die out and roll that until you get either a brain or shotgun. Now that all 7 dice have been rolled and are on the table, place your colored counters in separate piles matching the number of either brains (for Zombies) or shotgun blasts (for Hunters). You should have no more than 7 counters representing this first set of rolling. Start at step 2 and repeat this process until one side has all 13 of their colors. This is the winner for the game. If you chose wisely, you might just be that winner. Otherwise you were defeated in your solitaire game.